This page is for Sweet Rain by Y&Co. For the song of the same name by Jazztronik, see Sweet Rain (Jazztronik). Sweet Rain feat. Karin's jacket. tsubuyai teru dake de nani ga mieru? tsubuyaiteiru dake de nani ga mieru? What can you see if you only mutter things like that? 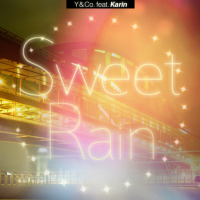 A long version of Sweet Rain, titled Sweet Rain feat.Karin, can be found on Y&Co. 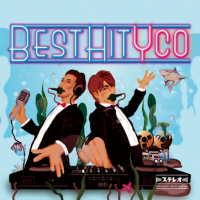 's album, BEST HIT YCO. The REFLEC BEAT series use a short edit of this version. An English remake of Sweet Rain, titled Sweet Rain 2018 feat. Cherry, can be found on Y&Co. 's second album, No No No limits 2 dAnce. Sweet Rain is unlockable in the Rainbow shirt class in jubeat knit and its APPEND version after earning all other unlocks from the White, Lime, Dandelion, Crimson, and Indigo shirt classes. The song may be unlocked for 10 Wool. Unlocking Sweet Rain will allow access to the Black shirt class. In jubeat prop, it is part of the Step unlocking system, unlockable by reaching Step Level 83. Sweet Rain marks Akira Yokota's first appearance in the jubeat series. The location photographed in Sweet Rain's jacket is the Portopia bridge, which itself is modelled after the Kobe bridge of Kobe City, Japan. Sweet Rain was one of the three songs available by default in jubeat plus from version 1.2.0 to 3.5.6, along with Snow Goose and ウィリアム・テル序曲. However, from jubeat plus version 3.5.7 onwards, Snow Goose and Sweet Rain were replaced as default songs. It is unknown if they will appear in jubeat plus again in a purchasable pack at a later date. In the REFLEC BEAT series, Sweet Rain's title and artist were changed to Sweet Rain feat. Karin and Y&Co., respectively. Sweet Rain feat. Karin was added to REFLEC BEAT limelight to promote the release of the BEST HIT YCO album. Sweet Rain feat. Karin is the only KONAMI original from REFLEC BEAT limelight that has not appeared in REFLEC BEAT plus. Sweet Rain was added to DanceDanceRevolution (2013) on August 3rd, 2013 as part of the jubeat・GITADORA・DDRのTriple Journey unlock event, which started on August 1st, 2013. To unlock Sweet Rain in DanceDanceRevolution, play one song from the jubeat folder while sorting songs under "BEMANI TITLE". From October 1st, 2013, it could be unlocked in DanceDanceRevolution (2013) and DanceDanceRevolution (2014) by playing two rounds with an eAMUSEMENT PASS. From DanceDanceRevolution A onwards, Sweet Rain is playable by default. Sweet Rain can be unlocked in DanceEvolution ARCADE on the SPACE KUMA event, which started on April 30th, 2014. Sweet Rain holds the record for having the highest notecount of every difficulty in the DanceEvolution series, with 105 notes for its LIGHT, 146 notes for its STANDARD, 309 notes for its EXTREME, and 333 notes for its MASTER charts. Its MASTER chart also holds the record for the highest notecount of all DanceEvolution charts. After being removed from the initial release of REFLEC BEAT 悠久のリフレシア, Sweet Rain feat. Karin was revived on December 15th, 2016. DanceDanceRevolution difficulty rated from 1 to 20 from X onwards. DanceEvolution difficulty rated from 1 to 5. This page was last edited on 23 January 2019, at 20:29.